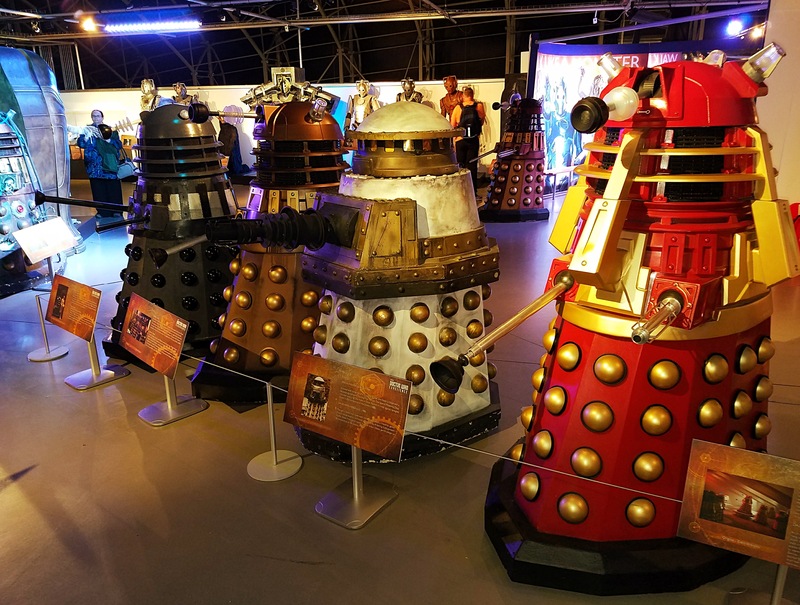 After a fun weekend at a Doctor Who convention in Swansea, you may think I was Who’d out, but you’d be wrong. 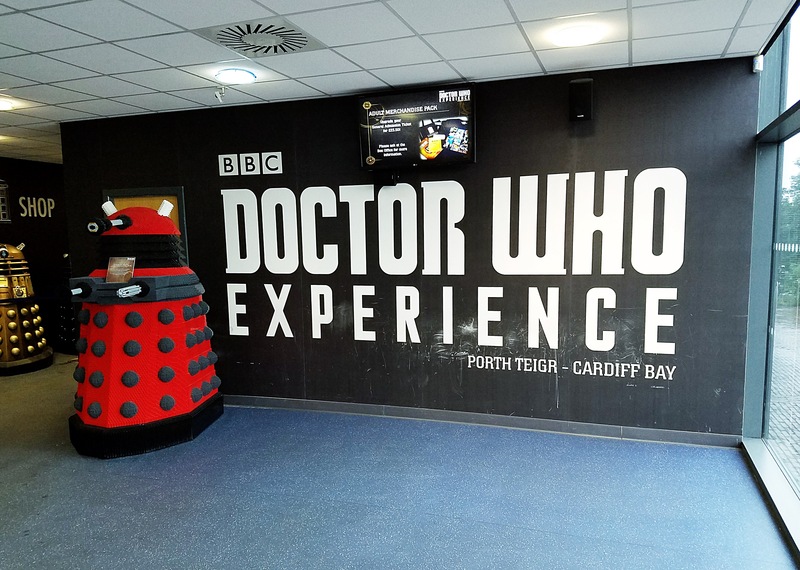 🙂 Matt, Douglas, and I made plans awhile ago to attend the Doctor Who Experience in Cardiff, about an hour from Swansea. 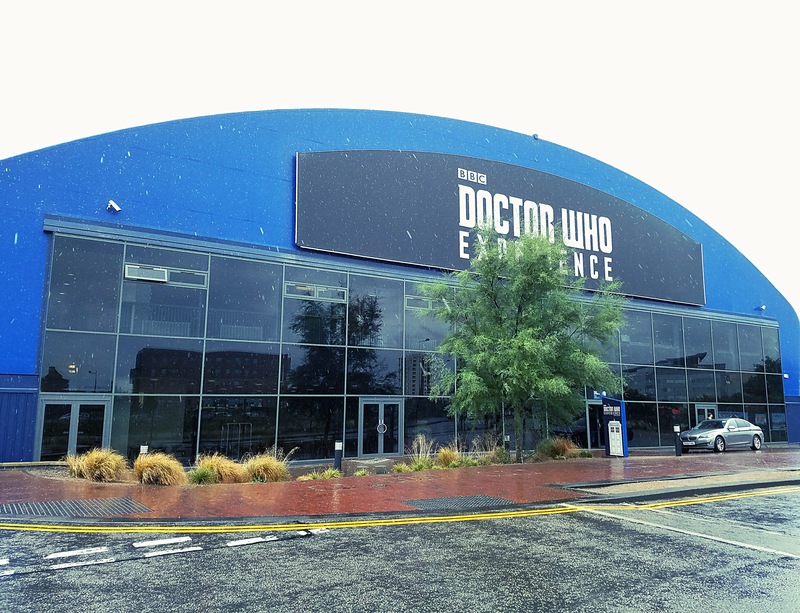 I was really excited to visit because I had never been before, though I visited a previous incarnation several years ago when it was at Earl’s Court in London (ironically, that’s just around the corner from where I’m staying on this trip), but the show has changed a lot in the intervening years! Tickets are pretty reasonable (£15/$20 USD) and you’re encouraged to book online ahead of time through the site linked above. You can also buy tickets in person, though if you don’t check the website ahead of time, you have no way of knowing which timeslots have availability. There was some kind of event happening in the morning, so the first available time on Monday was 130p, so that’s what we chose. 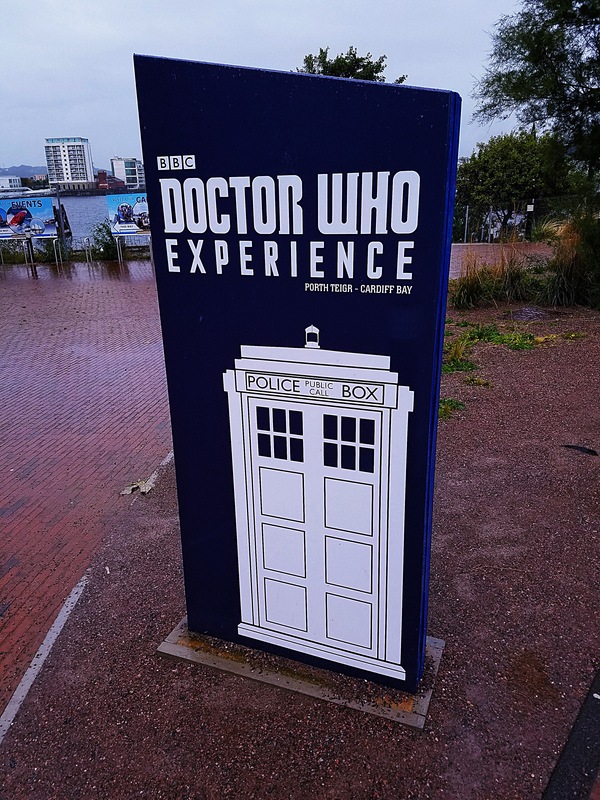 Over the weekend, our friend Mike, who lives across Cardiff Bay from the Experience, said he was planning on going as well, so we booked as a foursome and made our way to Cardiff from Swansea on Monday morning after saying goodbye to our Regenerations friends. 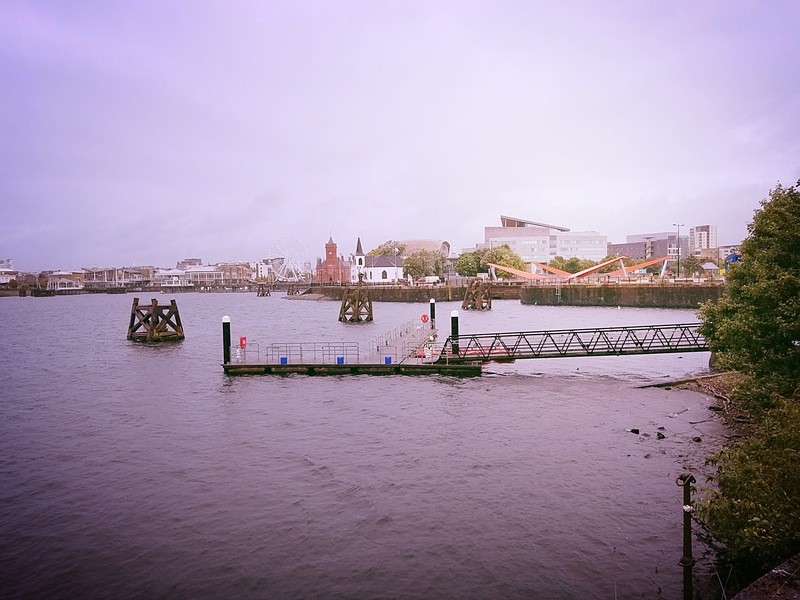 I’ve been to Cardiff once before, but I wouldn’t have minded doing some more exploring of the area around the bay, but it was raining somewhat heavily when we arrived and we didn’t have a ton of time anyway, so we opted to grab some lunch instead (if you have the time though, definitely plan time to see some of Cardiff, if only to see the many locations where Doctor Who has been filmed). There’s a place called World of Boats next to the Experience and Mike told us their café is quite nice, so that’s where we went. It’s a small, comfortable place, but has a decent menu and the food was tasty, so I recommend it! I wasn’t too hungry as we’d had breakfast a couple of hours earlier, but Matt and Douglas both enjoyed some delicious-looking cawl while Mike had a panini and I had a piece of cake. 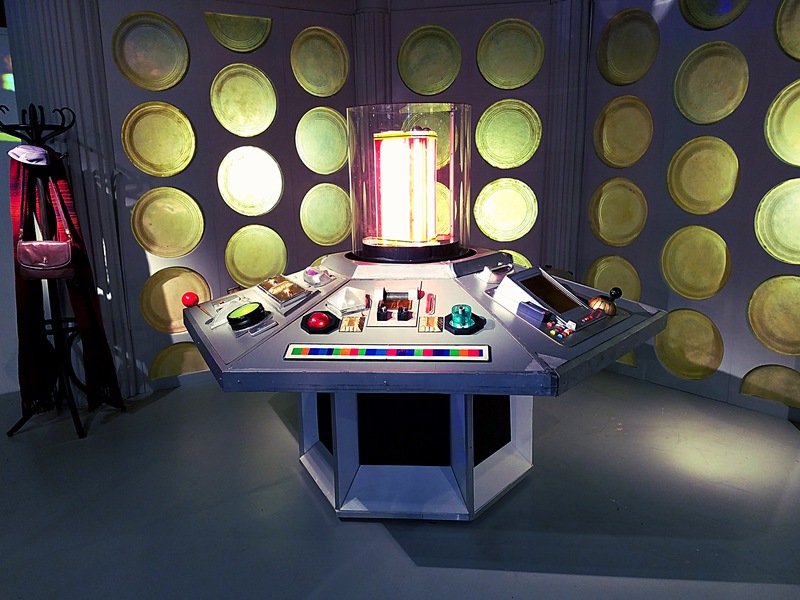 That gave us the energy we needed to explore 53 years of Doctor Who history! 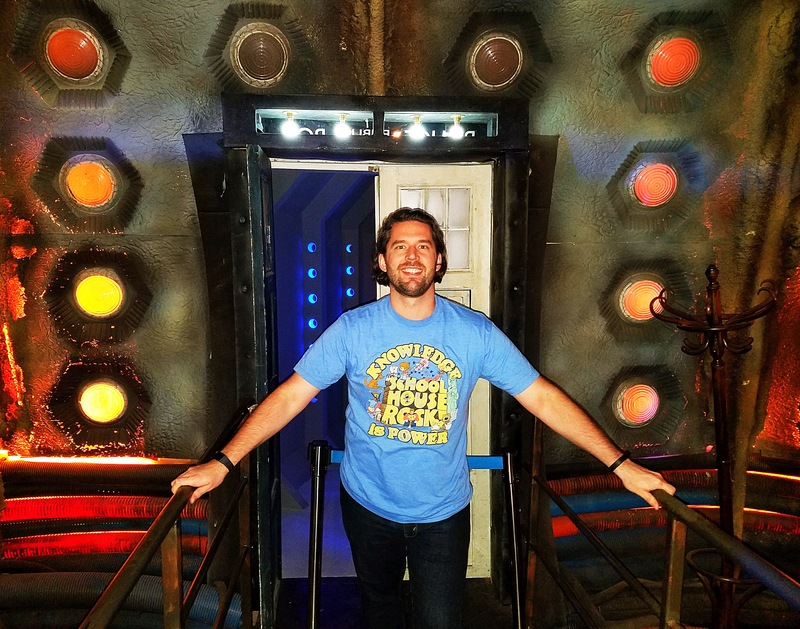 After lunch, we headed into the Experience and awaited our entry, which came fairly quickly. 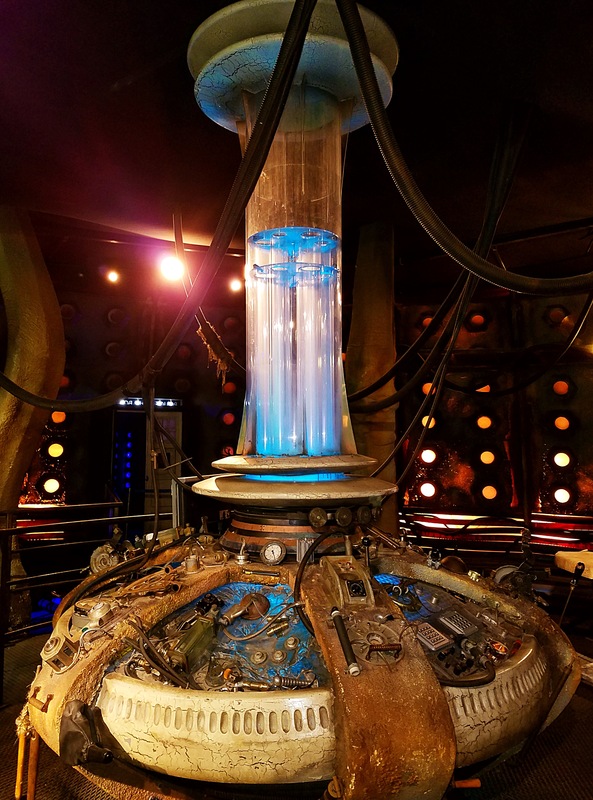 They take groups of ~30 people in at a time to go through the first part of the Experience, which is an adventure with Peter Capaldi. I won’t spoil anything about it, but it’s a fun way to get started, so look forward to it when you book your tickets! No photography/videography is allowed during the adventure, but after that, you can snap photos to your heart’s content, so have your cameras and phones ready! 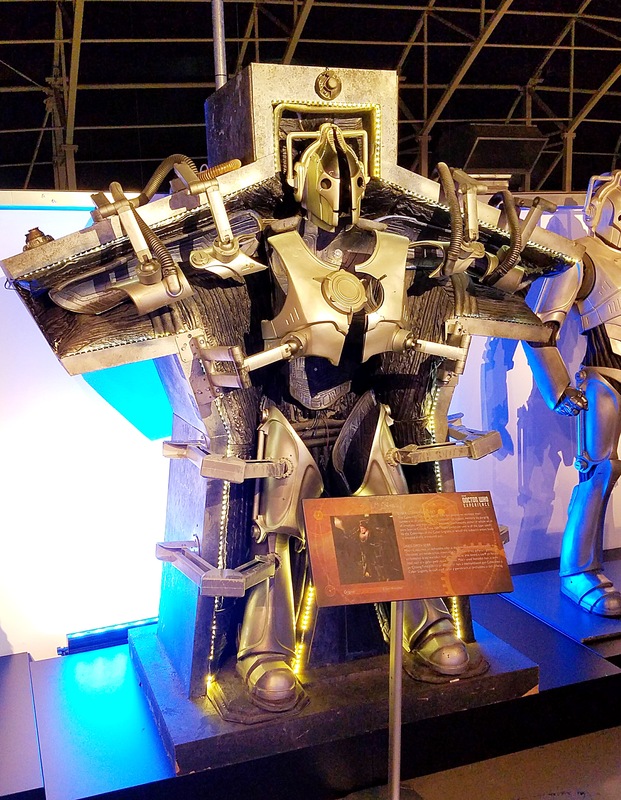 Everything else in the Experience is self-paced, so you can take as long as you like to see all the cool props, costumes, etc. from the show. And of course, don’t forget to buy some shiny things in the shop at the end! As for the rest of this post, I hope you want to see pictures because I’m sharing a lot of them. 🙂 And this doesn’t even include all the ones I took! Approaching the building before heading next door to World of Boats for lunch. 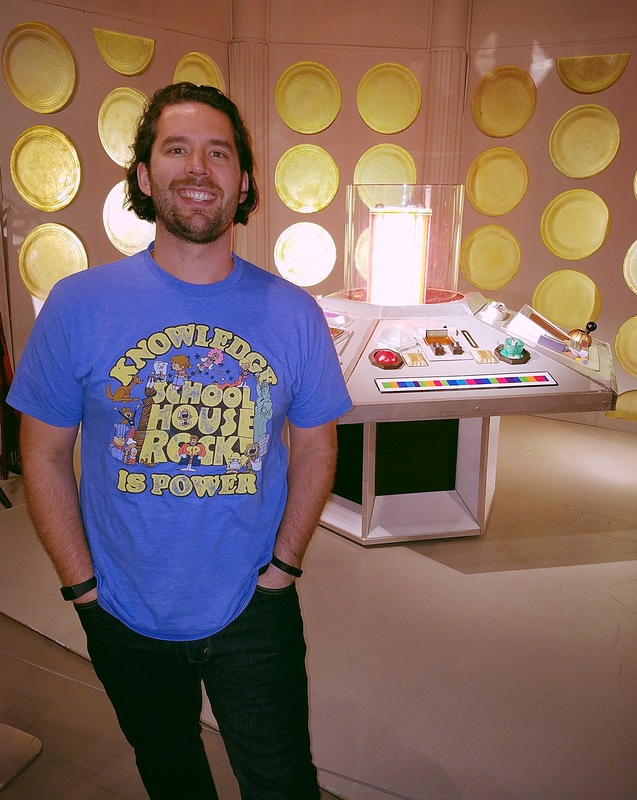 I’m a sucker for anything with a TARDIS on it. 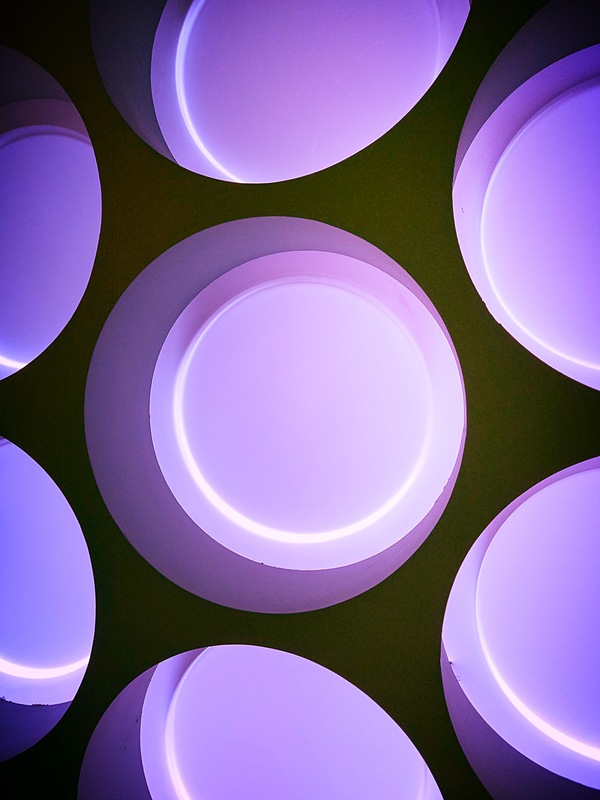 Can you spot the TARDIS in this photo? 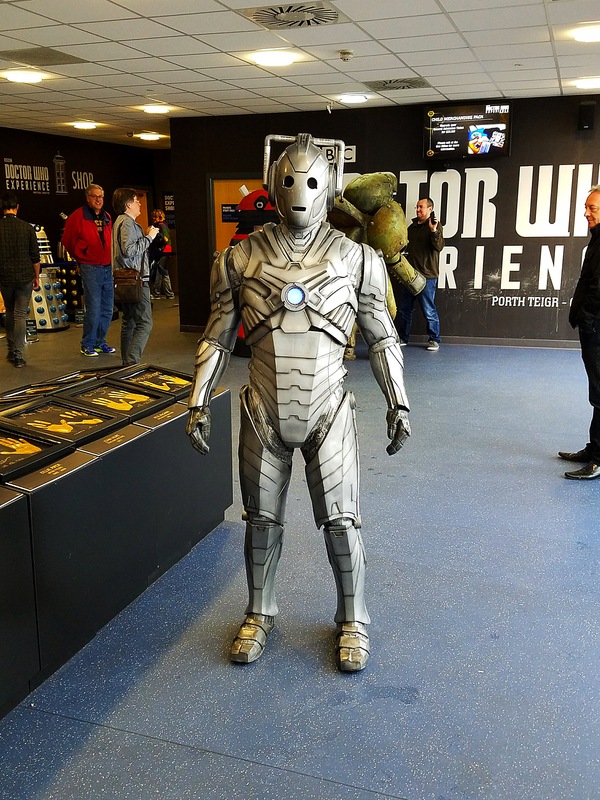 We had a cyberman keeping us company while we waited to go in. 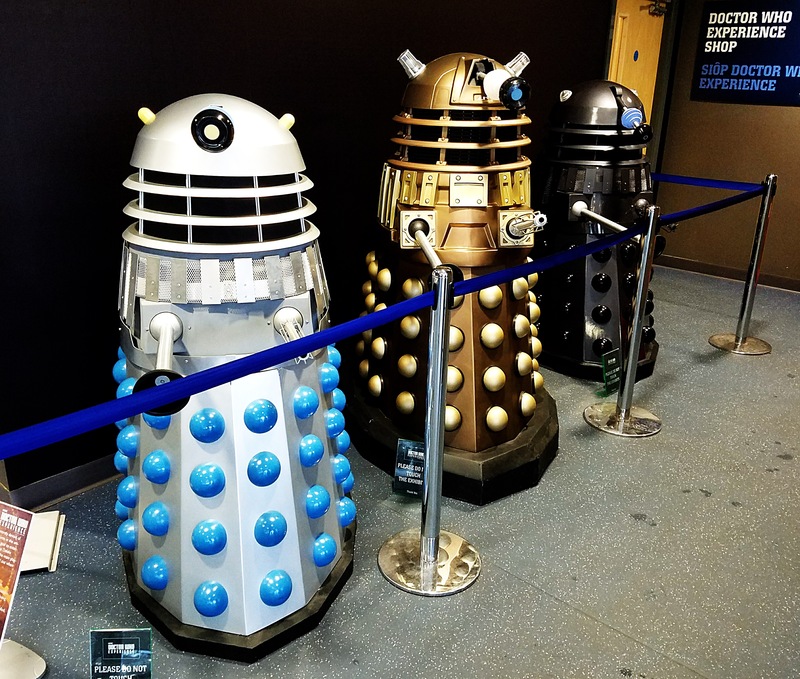 Daleks! In the entrance hall! 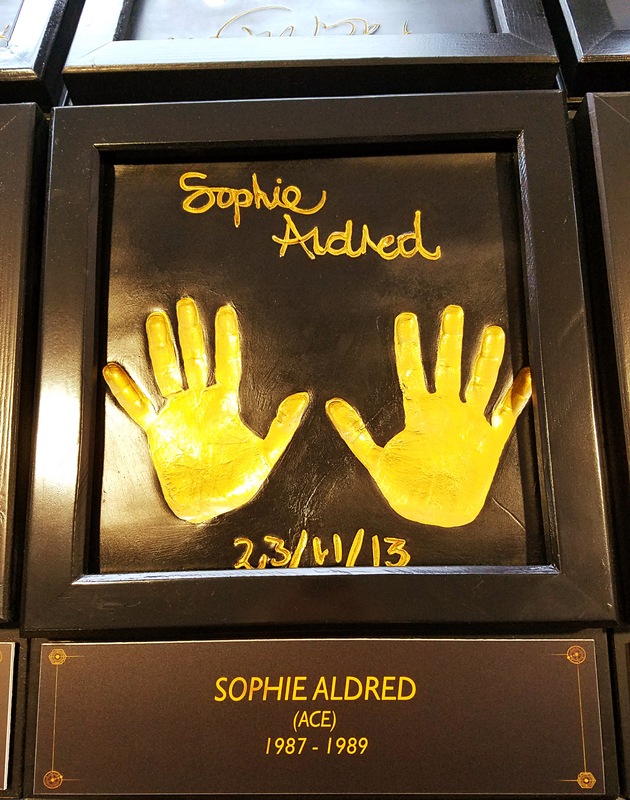 I had to take a picture of this because those handprints belong to my friend Sophie! 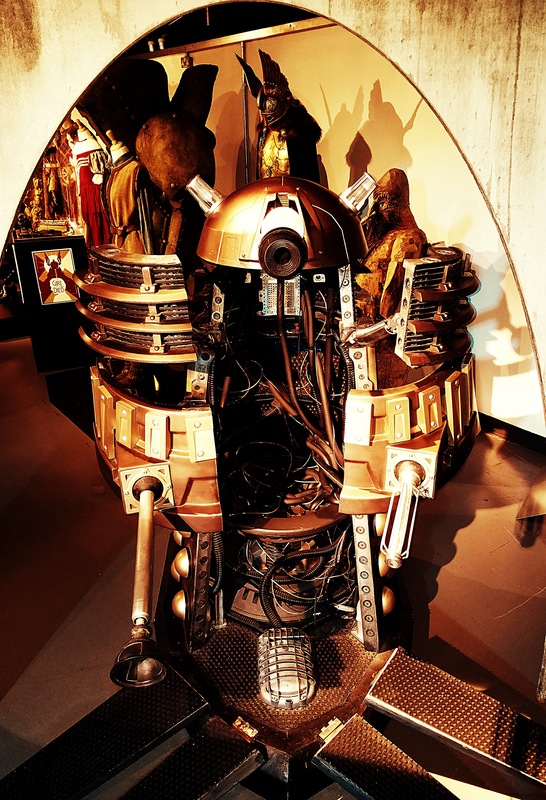 It took a lot of Lego bricks to build that dalek. 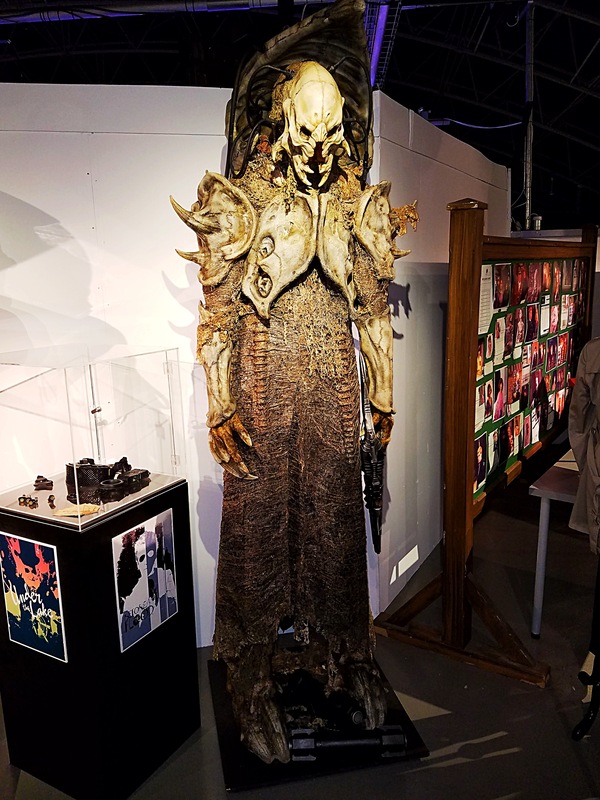 The costume for Omega as seen in the 1983 story Arc of Infinity. 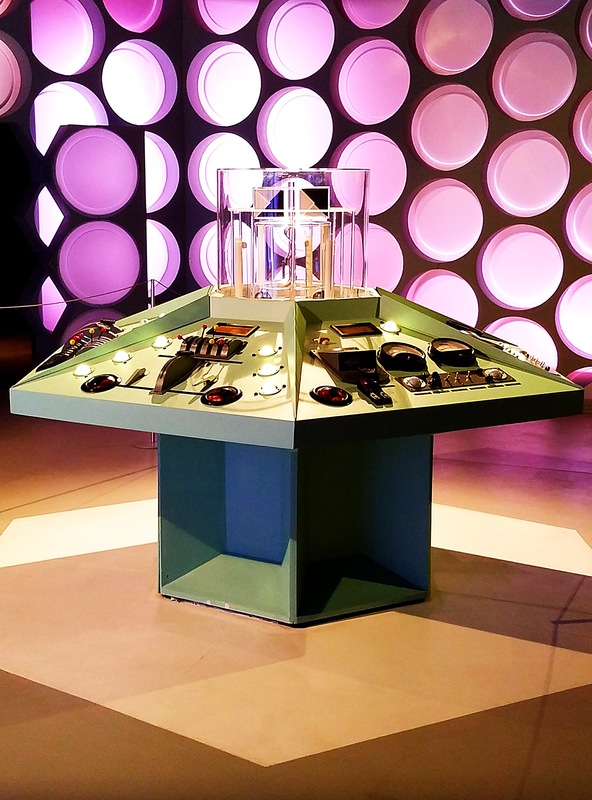 Now entering the actual exhibition after our adventure with the 12th Doctor. 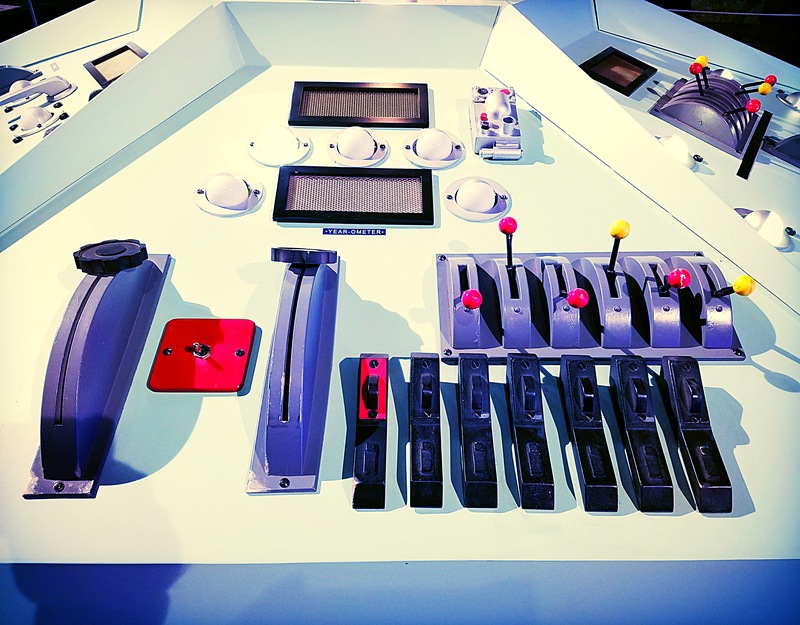 I love all the TARDIS consoles, so I took lots of photos of them. Zooming in on some of the controls. I don’t think that Yearometer is calculating properly! 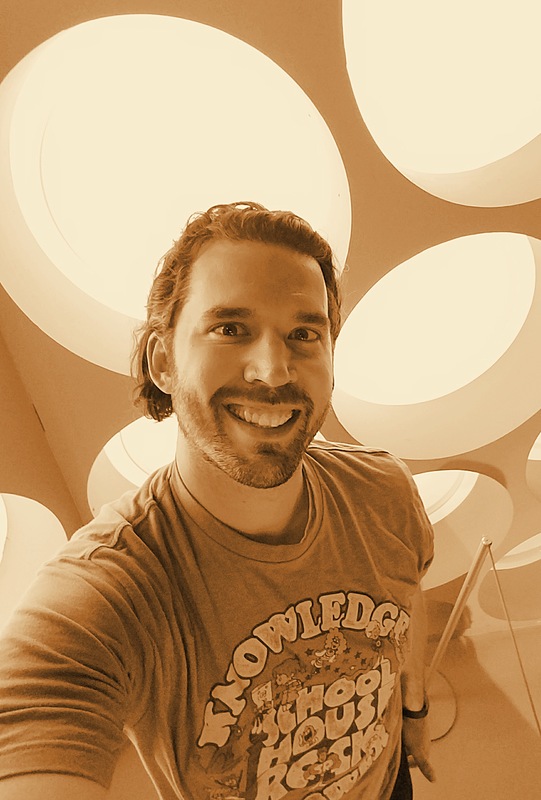 Oh go on – another selfie then. 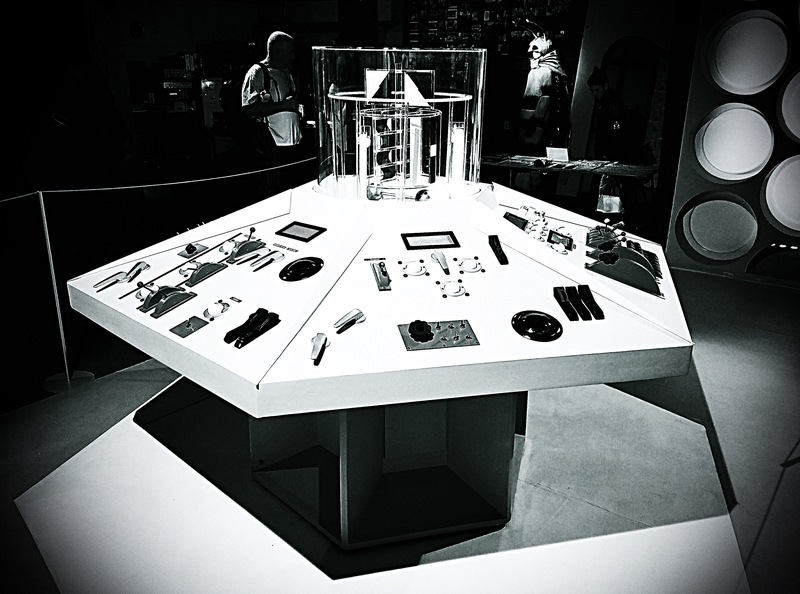 Different angle of the console after getting a bit further into the exhibition. This was pretty much the perfect angle for the original console. So perfect, in fact, that I had to do both a black-and-white and a color version. 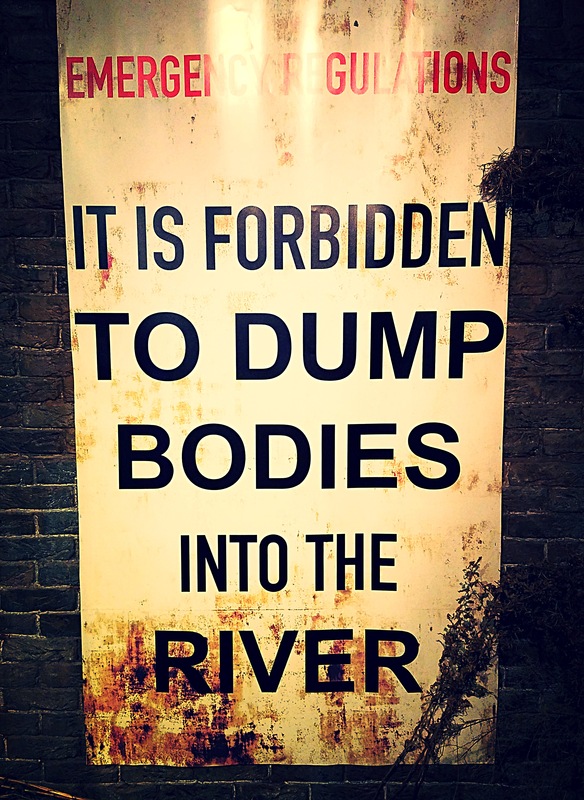 Sound advice! 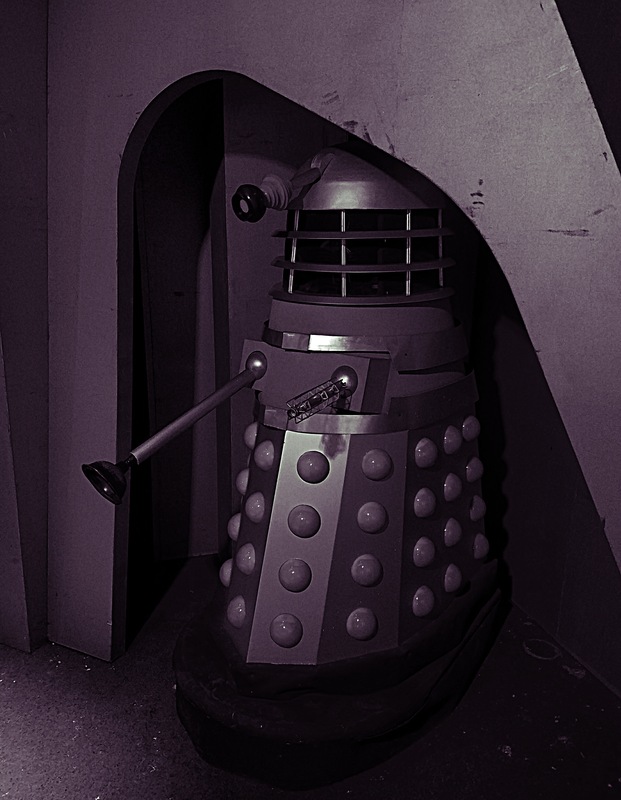 This is from the 1964 story The Dalek Invasion of Earth (though it’s not the original set). 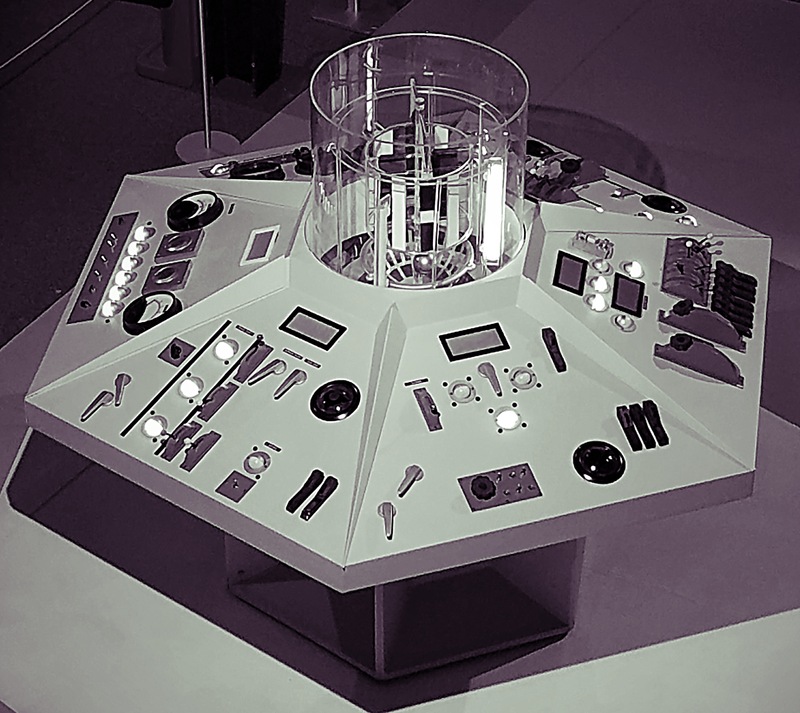 Again, not the original TARDIS, but it’s a very good reproduction from An Adventure in Space and Time. 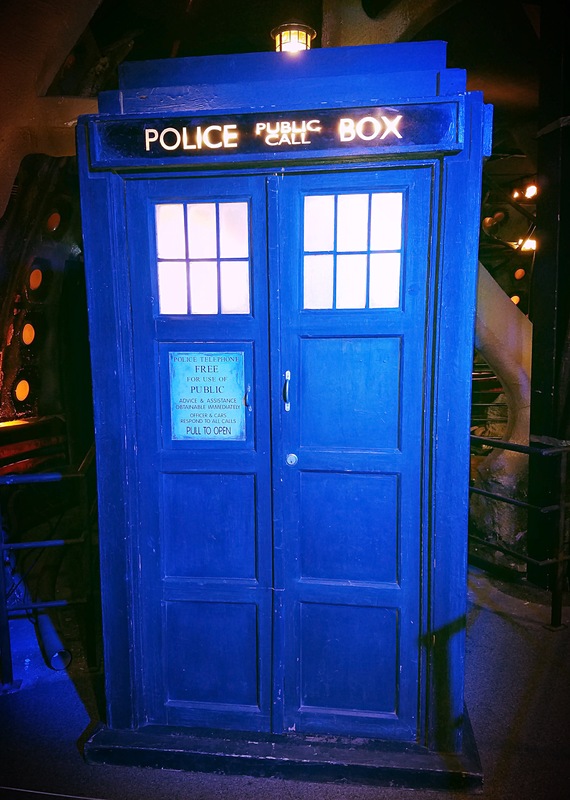 Did I mention I love anything TARDIS-related? My favorite console! 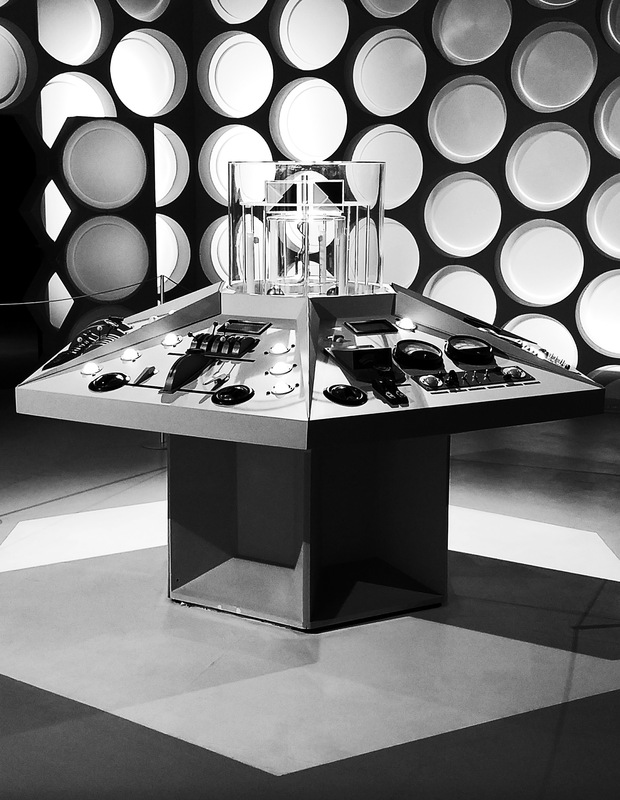 This one debuted in the 20th anniversary story The Five Doctors in 1983. Different lighting on my favorite console. 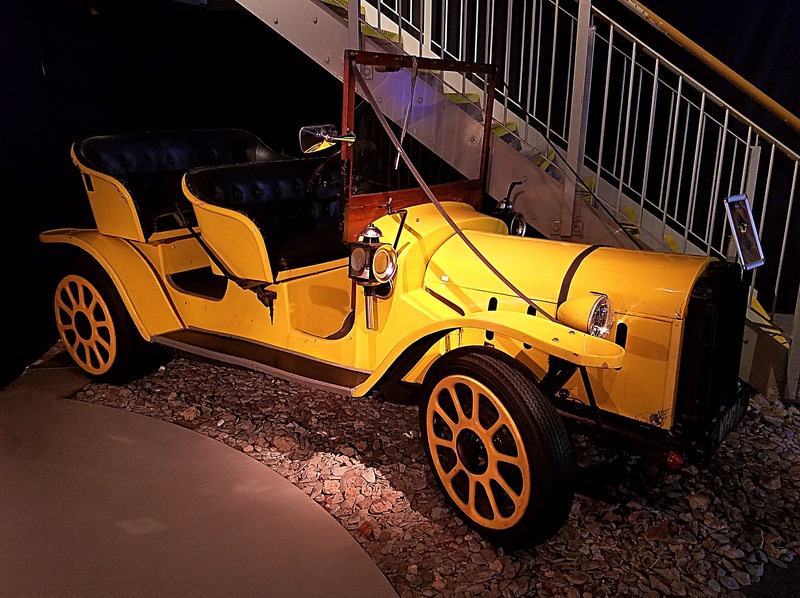 Bessie, the preferred method of transportation for Jon Pertwee’s Third Doctor. 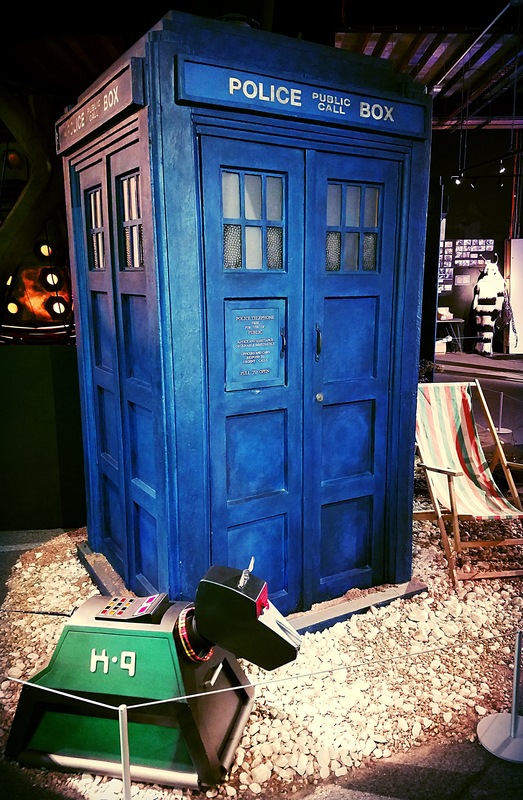 The 1980s TARDIS with K9. 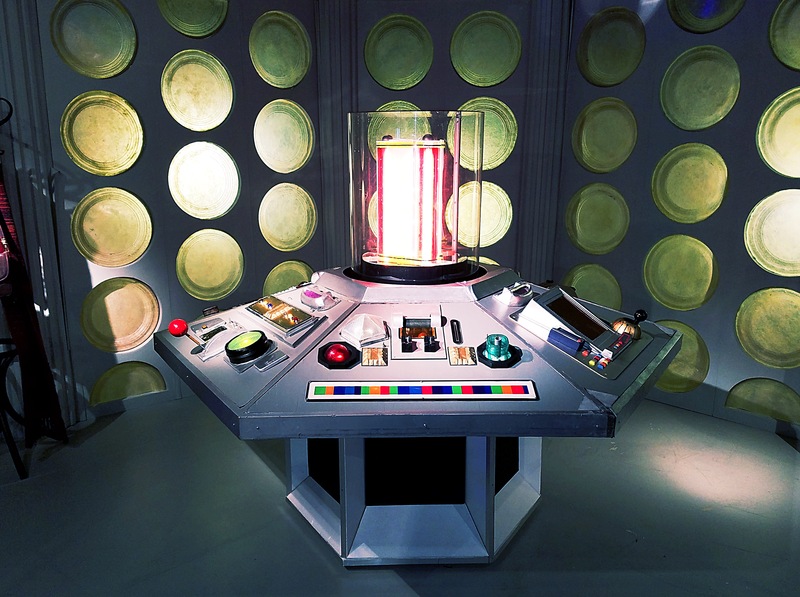 Me in the 9th/10th Doctors’ console room. 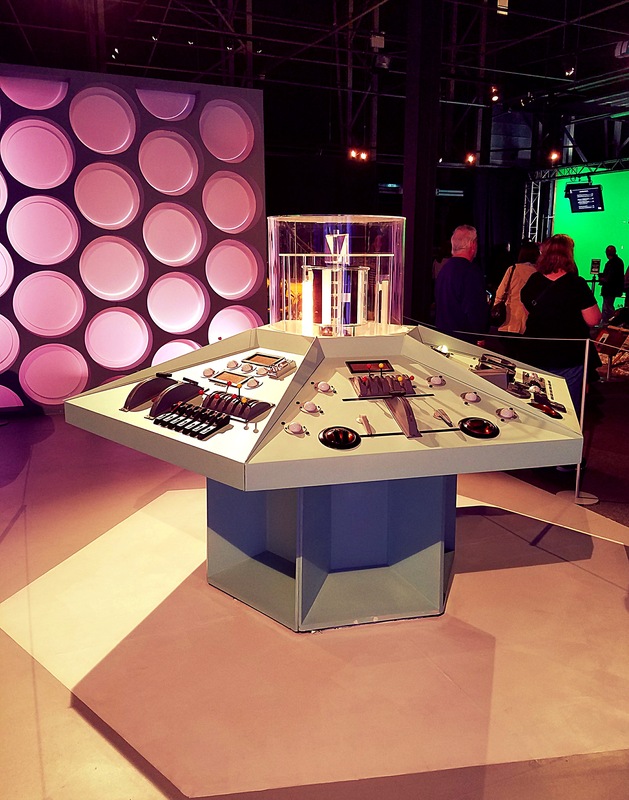 Another shot of the console. 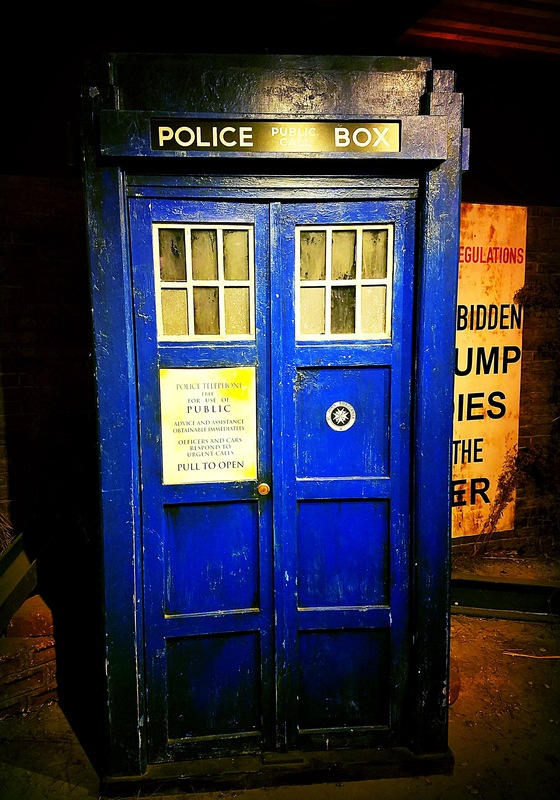 Yep, another TARDIS (9th/10th Doctor). 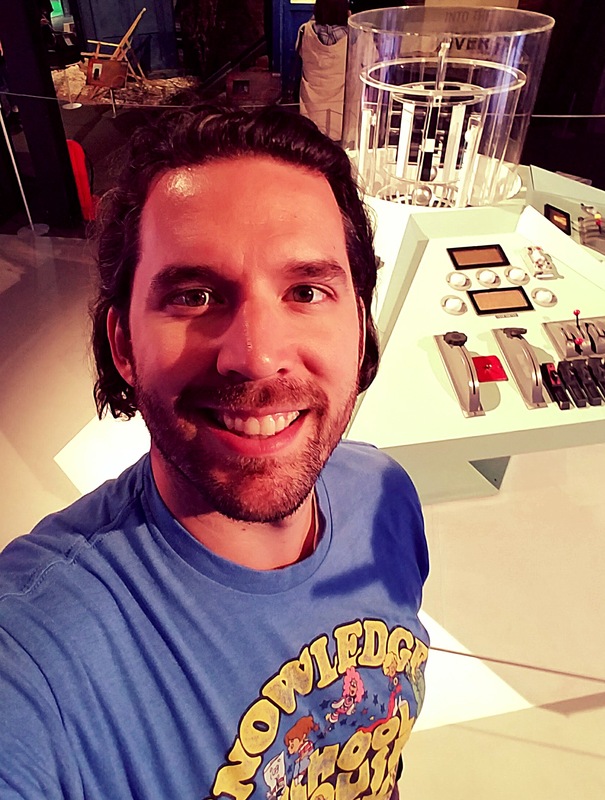 The Experience is on two levels, so I got to look over the consoles on the lower level as I walked upstairs. 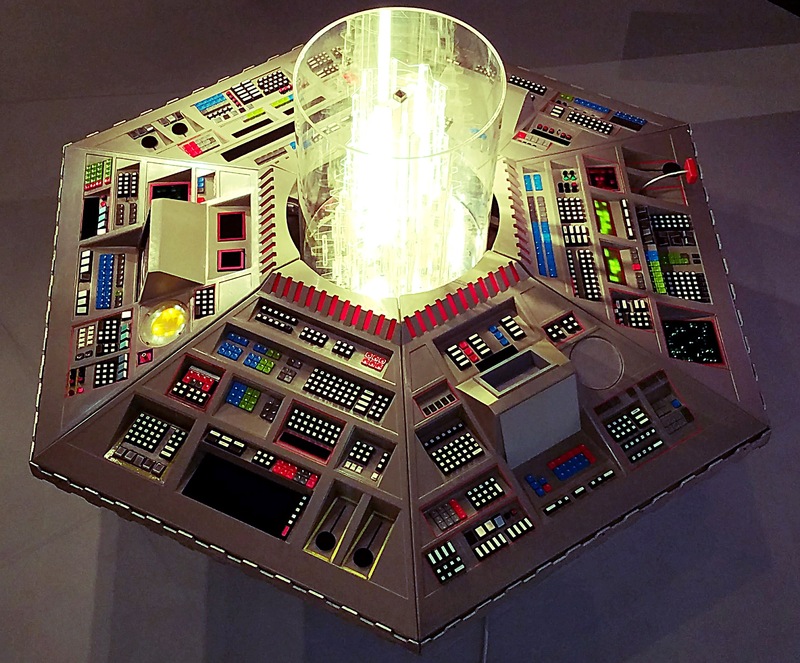 The angle wasn’t quite as good for the original console, but still cool. 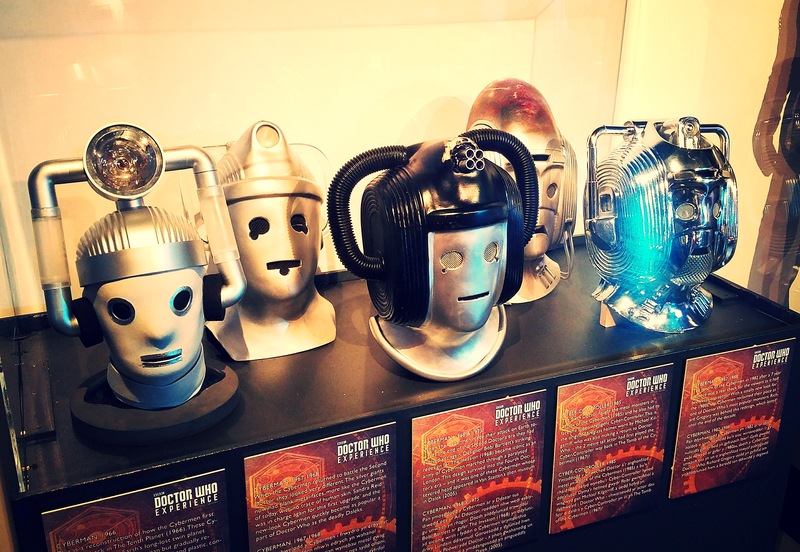 Cybermen! Well, their heads anyway. 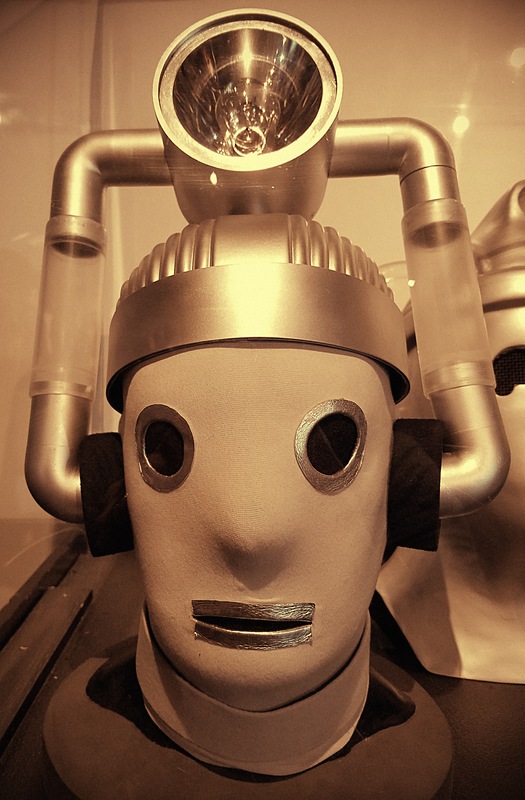 Close up on the first incarnation of the Cybermen from the 1966 story The Tenth Planet. 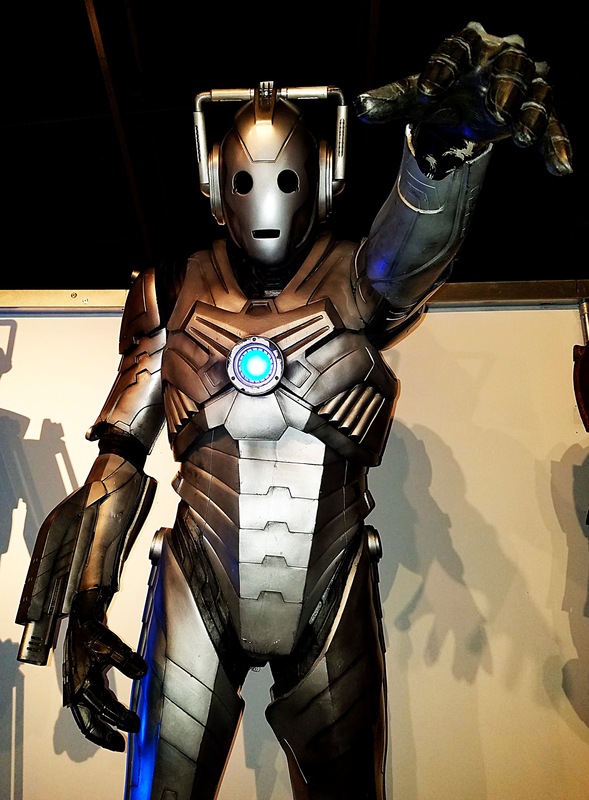 Cyber conversion unit from the new series. 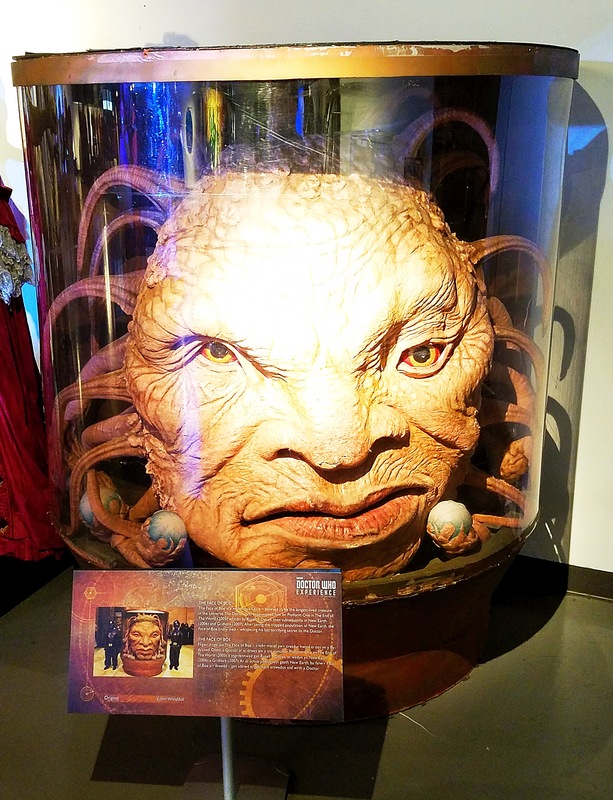 The Face of Boe, who debuted in the first series when the show was revived in 2005. Lots of monsters from the new series. 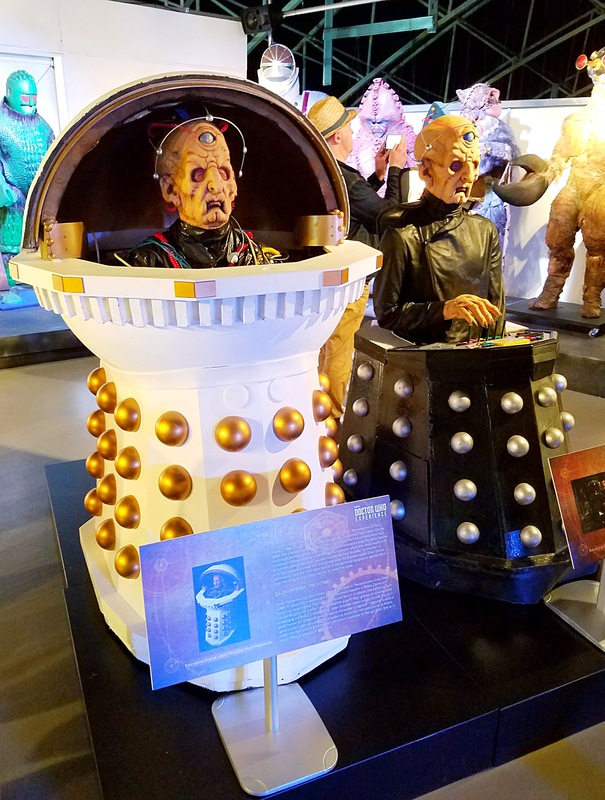 Davros as both himself and the Emperor Dalek (1980s stories). 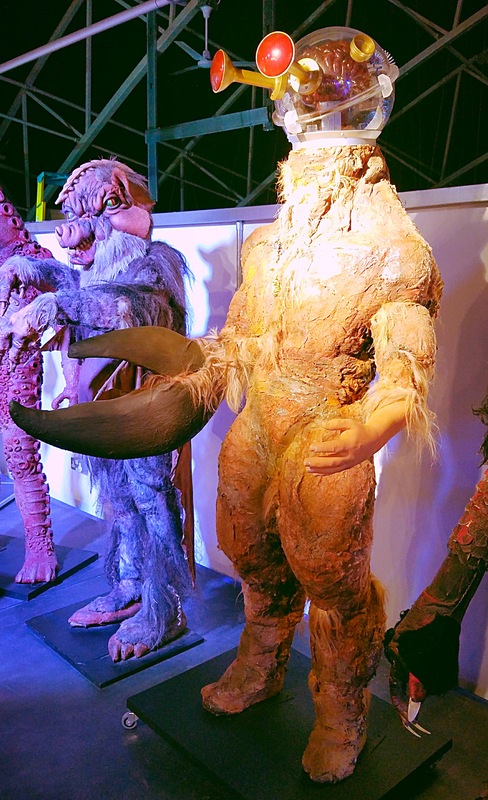 Melkur from the 1981 story The Keeper of Traken. 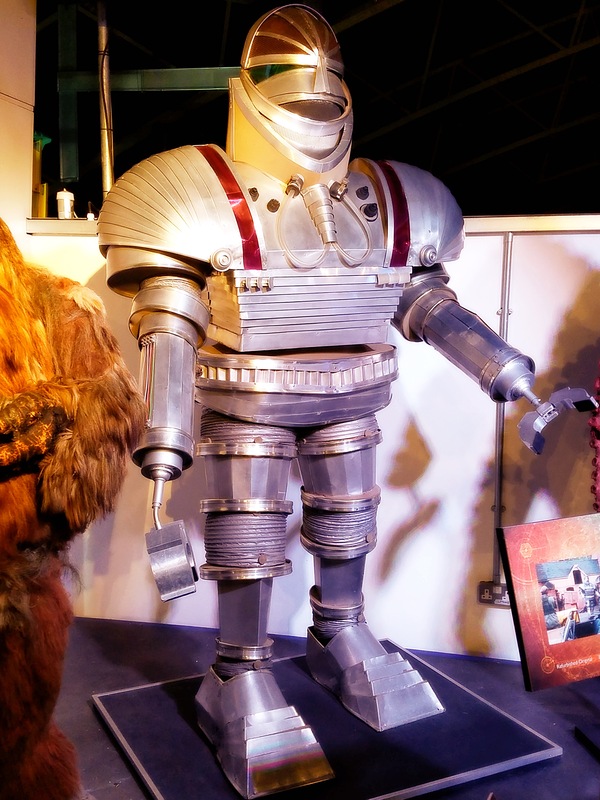 The giant robot from the 1974 story Robot, which introduced the Fourth Doctor as played by Tom Baker. 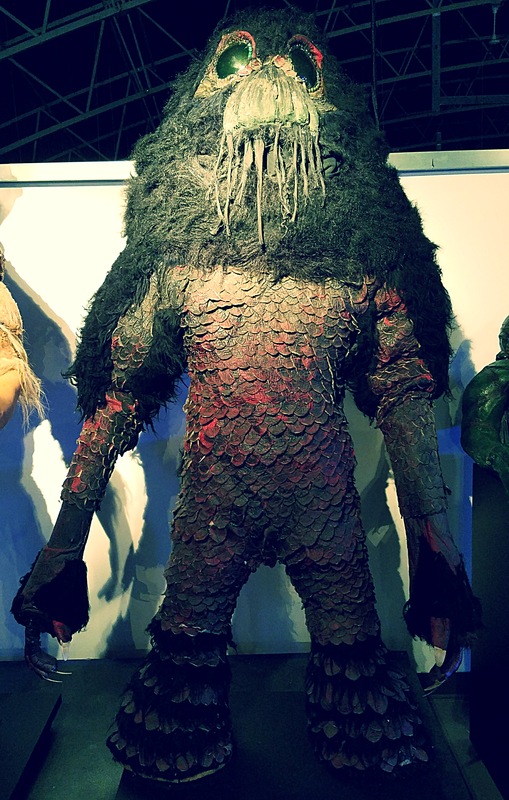 A Mandrel from the 1979 story Nightmare of Eden. This beauty was only brought into the Experience very recently. Morbius, from the 1976 story The Brain of Morbius, was also just added recently. 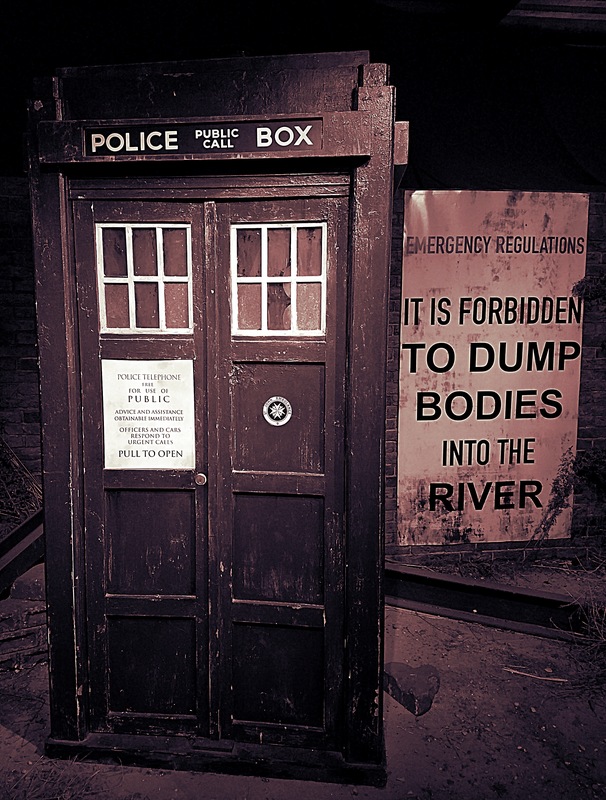 A new series reference to Amelia Pond’s childhood memories of the Doctor. 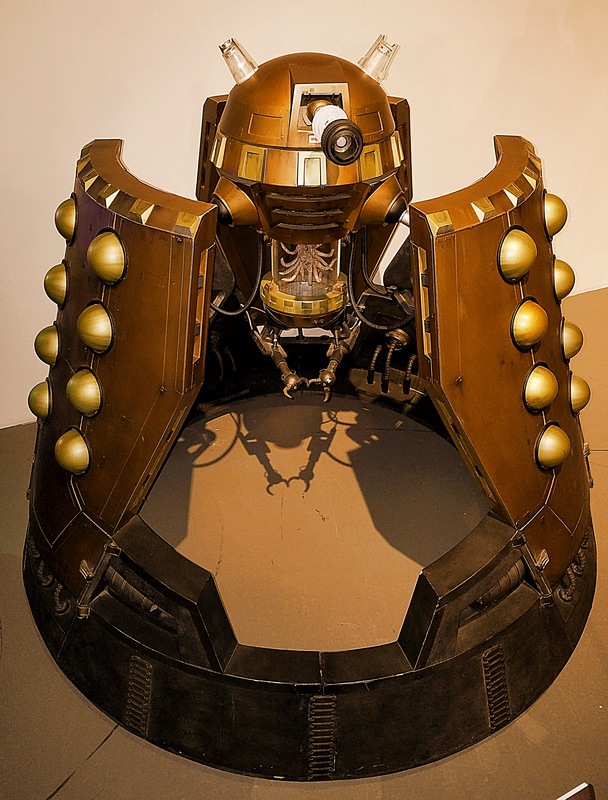 The Emperor Dalek model used in the finale of Series 1 in 2005. 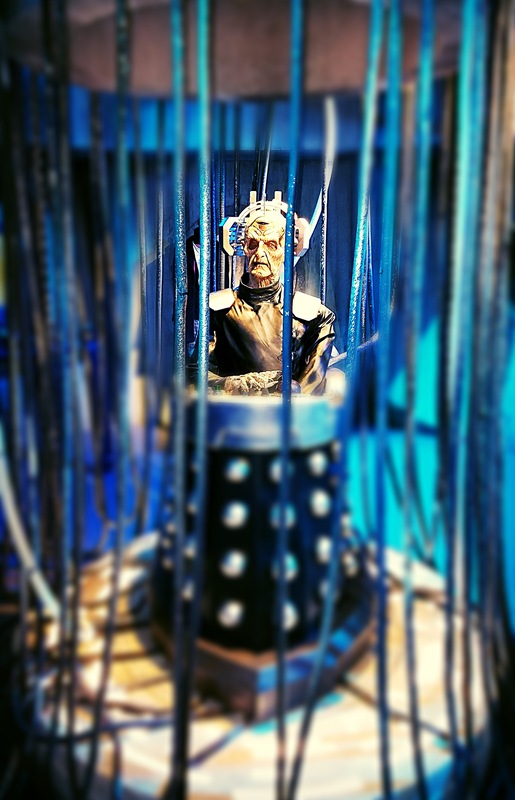 Davros as he appeared in the 2015 series of Doctor Who. I was delighted to find another console! 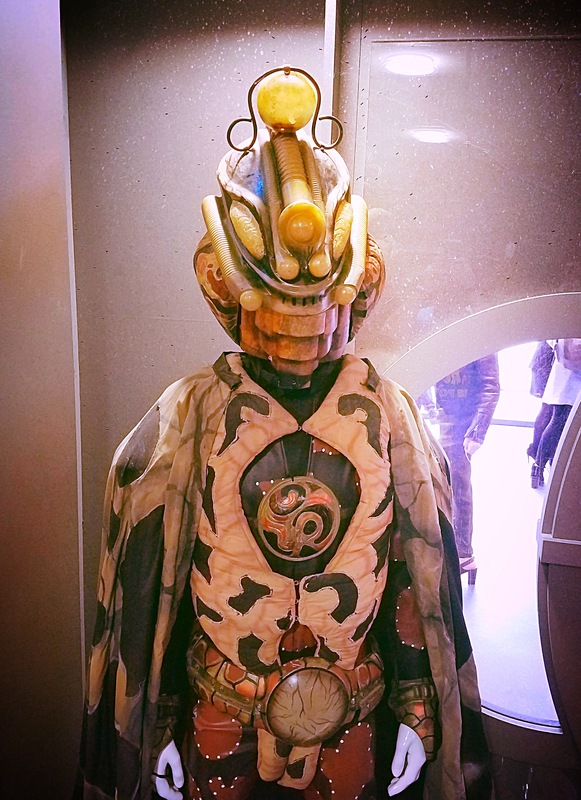 This incarnation was last seen in the 1984 story The Two Doctors. I was able to get it from a great angle! And of course I also got a picture with it. 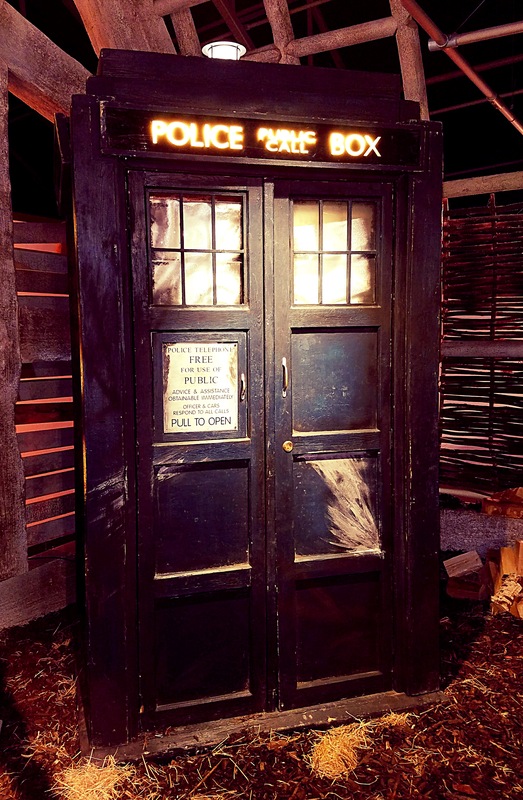 The War Doctor’s TARDIS as seen in the 50th anniversary special, The Day of the Doctor. 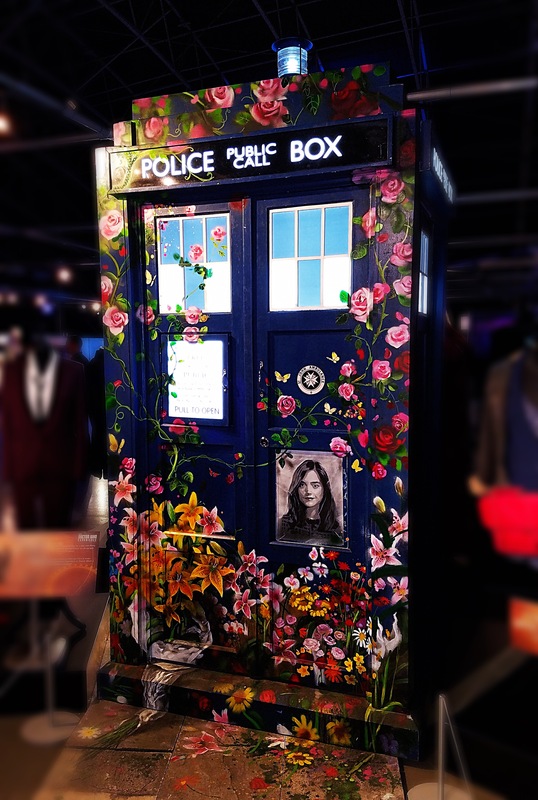 The TARDIS painted in memory of Clara as seen in the 2015 story Face the Raven. 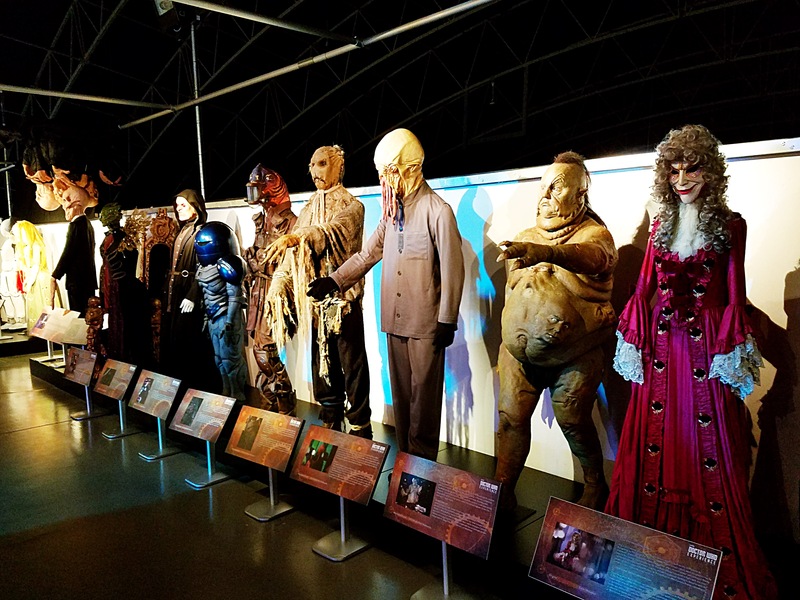 Cool panorama of all the costumes of the Doctors. 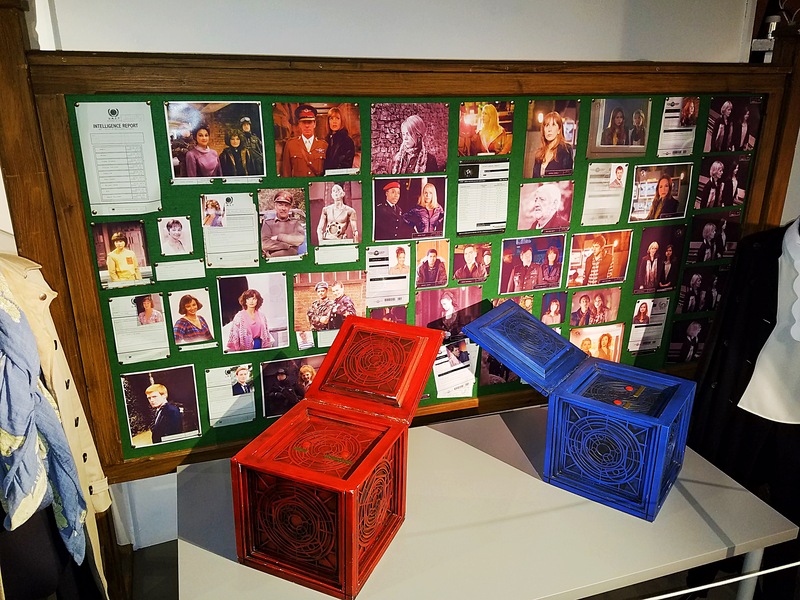 The board UNIT uses to track all known companions of the Doctor. 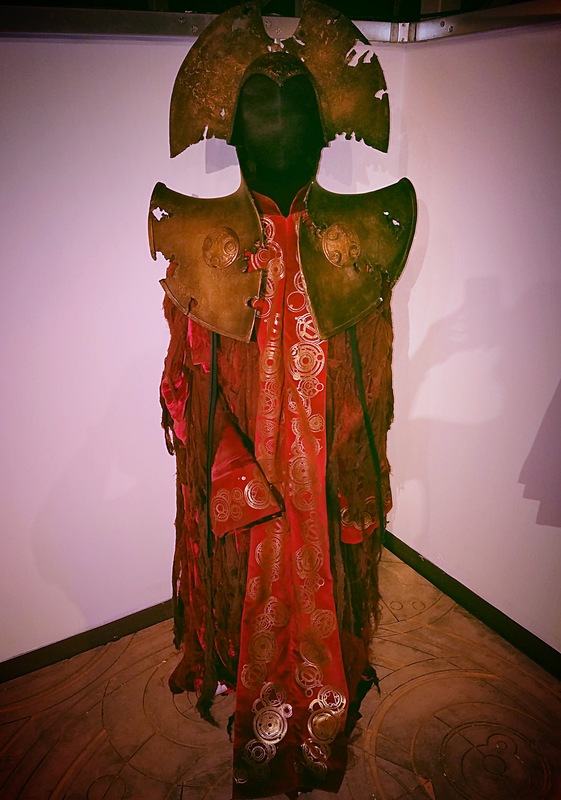 One last monster – the Fisher King from Under the Lake/Before the Flood in 2015. 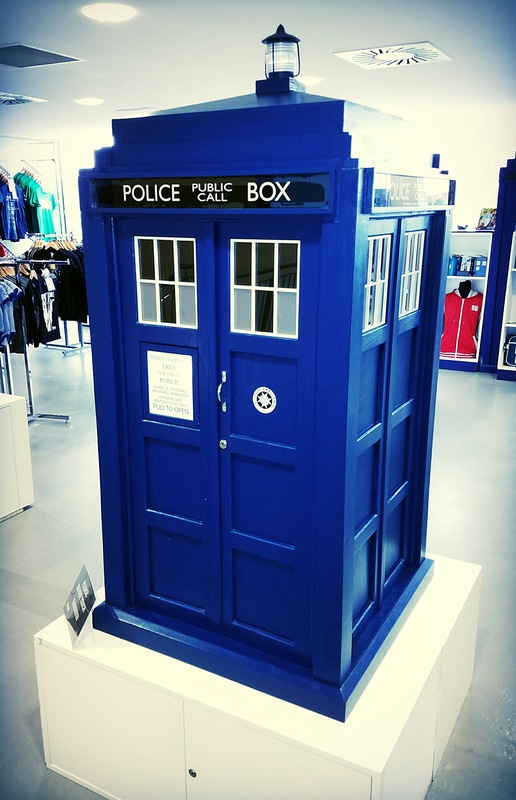 Shrunken TARDIS in the gift shop. 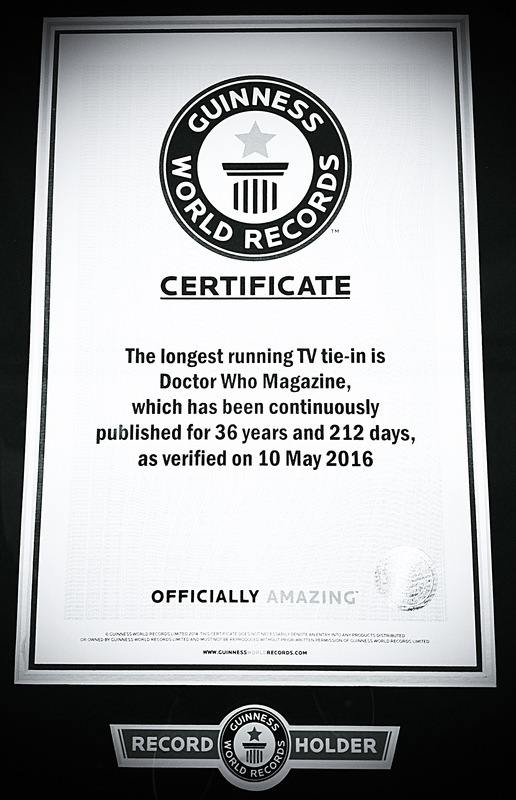 Guinness World Records certificate for Doctor Who Magazine in the function space next to the gift shop, which currently houses an exhibit about DWM and the covers of the Target novelizations. 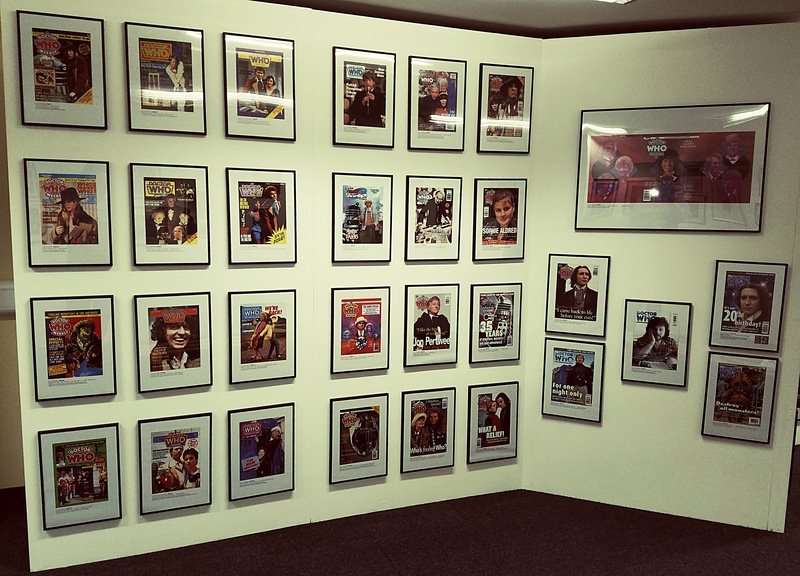 A selection of DWM covers from the exhibit. Whew! Lots of photos, but I hope you enjoyed them as I certainly enjoyed taking them! 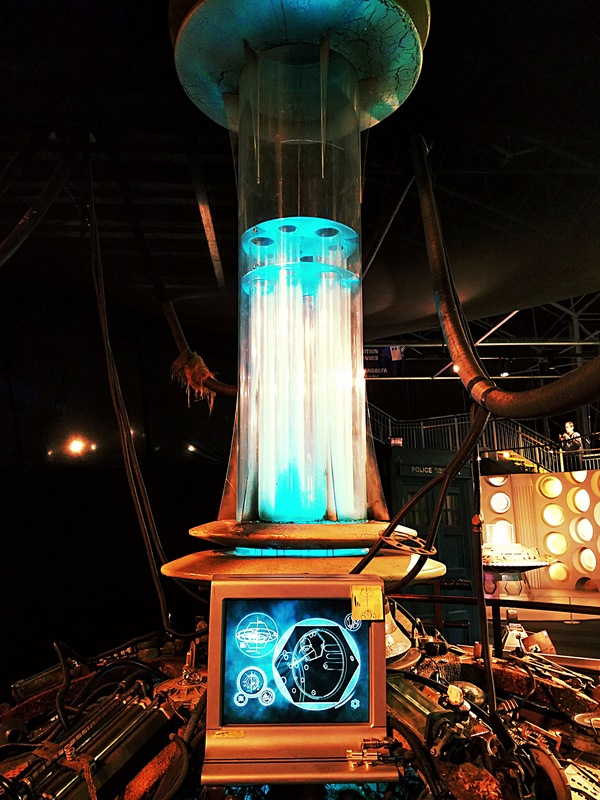 Going to the Experience was so much fun and I can’t recommend it enough if you’re a Doctor Who fan! After the fun of the Experience, we got back on the road towards Brighton, where the plan was to drop Douglas off and then drop me at one of the train stations there so I could get a train to London, where I’m spending the rest of my trip. Matt had the brilliant idea to drop me at Gatwick Airport though as it was on the way and taking a train from there would prevent me from having to backtrack by going to Brighton and then to London. I could have taken a regular train, but I opted for the quicker Gatwick Express – just under £20/$26 USD and 30 minutes, which was perfect. 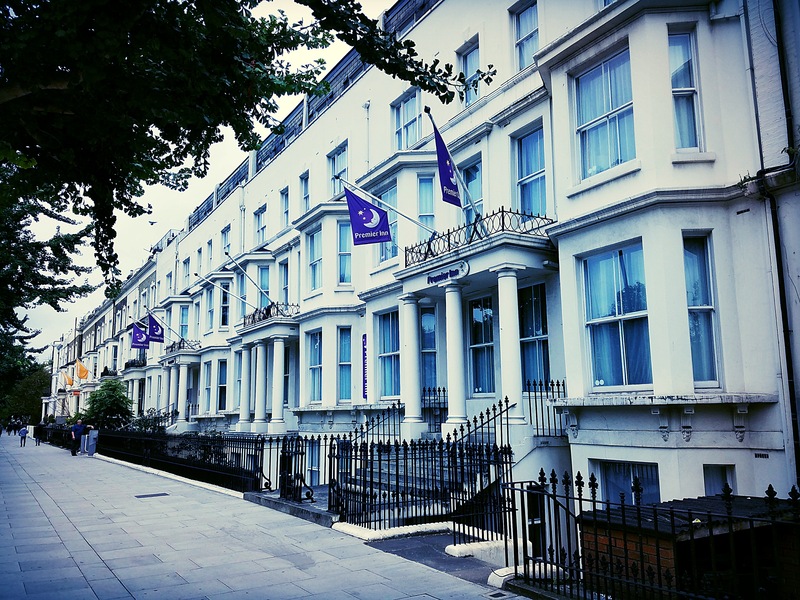 The train brought me to Victoria, where I caught the Underground to Earl’s Court and walked to my hotel from there, just a few minutes away. 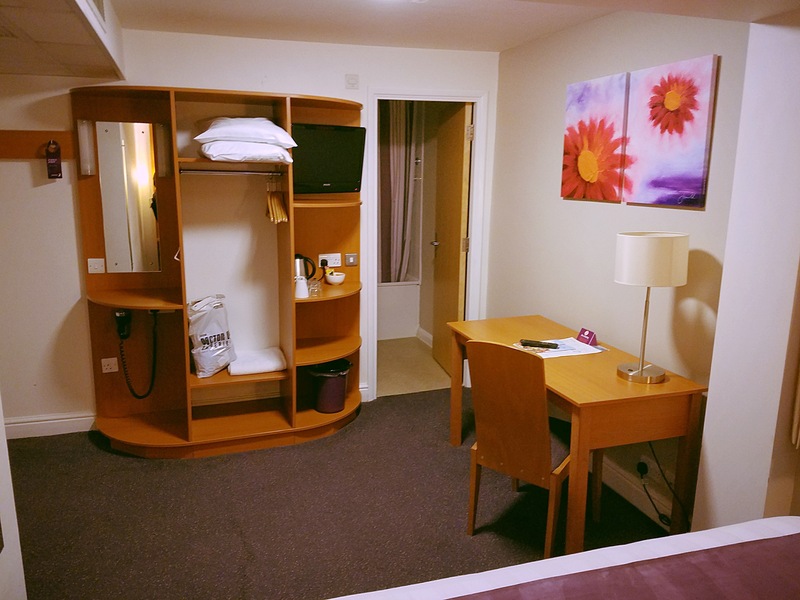 Would you believe I’m staying at another Premier Inn? 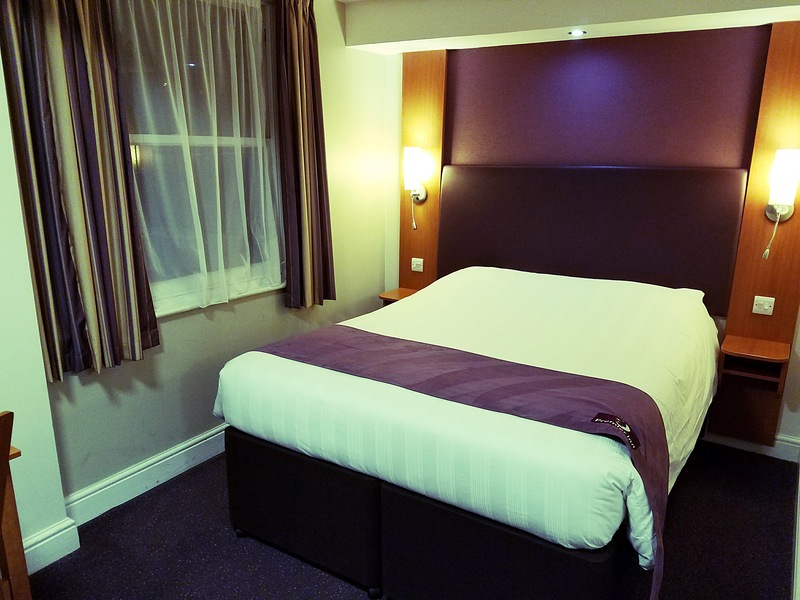 They’ve proved to be a reliable and comfortable chain, so I was happy to stay in another one for my first hotel stay in London (weird, but I’ve never actually stayed in a hotel here because I always stay with friends). It’s been a great home away from home so far! Check out a few pictures below. Looks like a great old building on the outside. Plenty of room for one! It’s not the biggest room in the world, but it works perfectly for me. 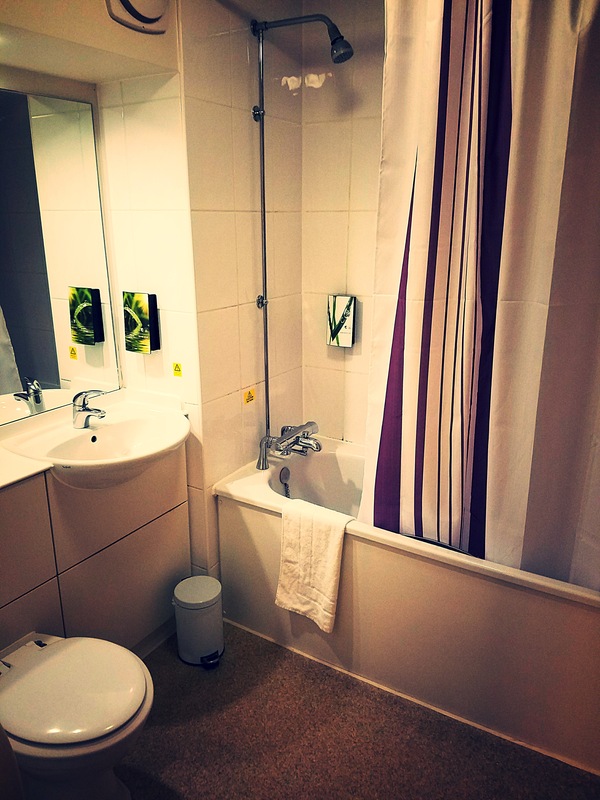 Perfectly adequate bathroom as well (and again, it has great water pressure). 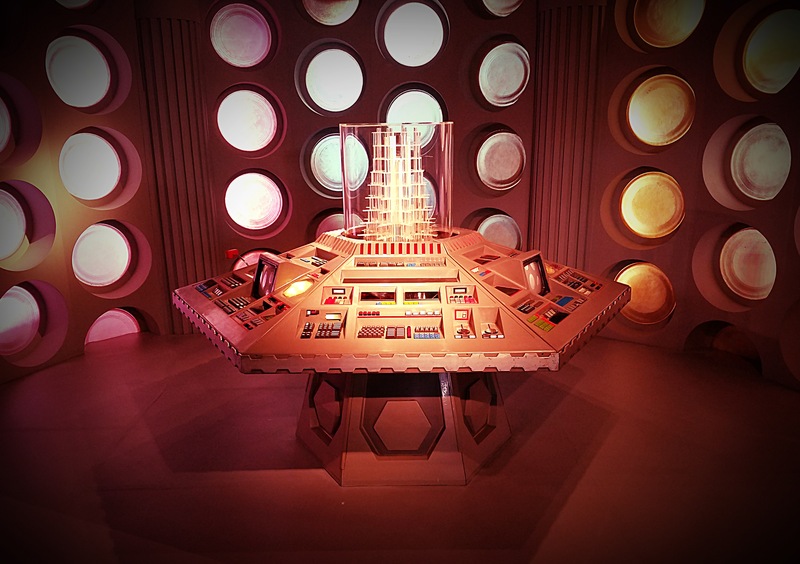 Don’t worry – no more posts with a million photos and no more Doctor Who-centric ones either. 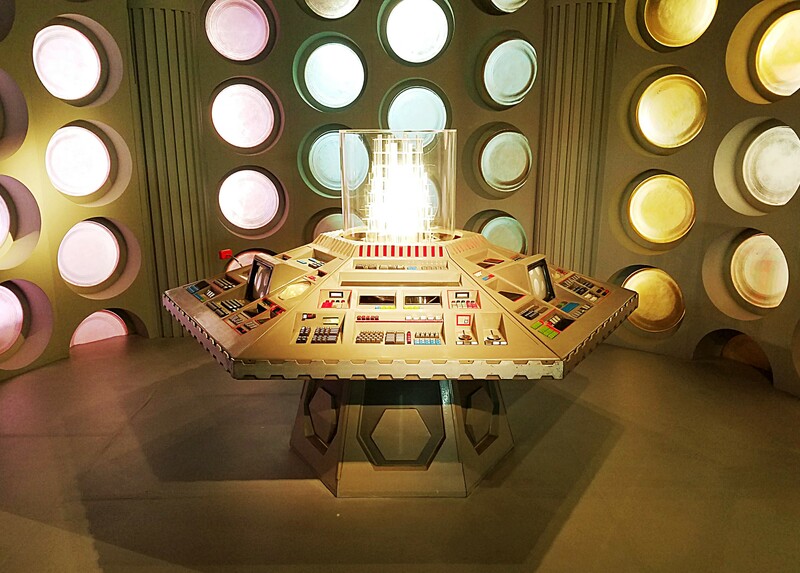 I’m just about caught up with my posts relative to where I am on the trip now, so look for more on my London exploits soon! Love the pictures and description of your time abroad. 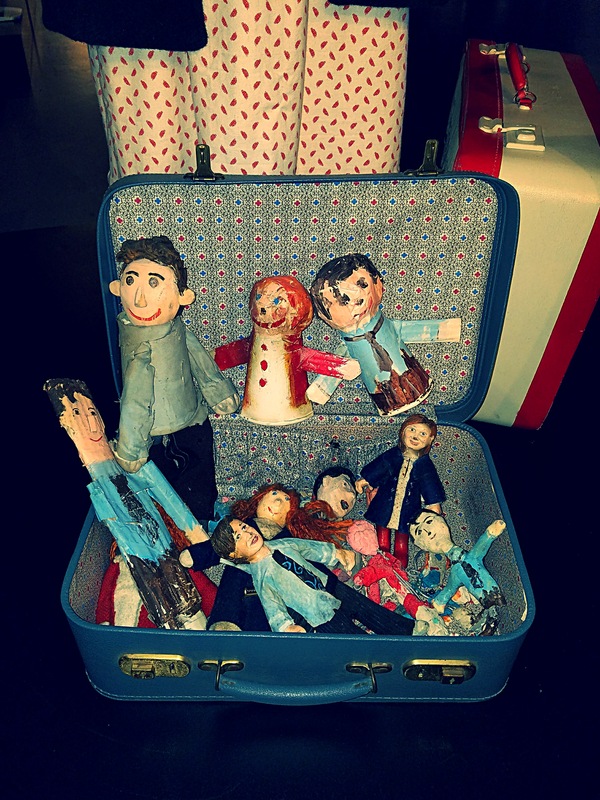 So glad you are enjoying yourself (and maybe a little jealous). Be careful!